Behind the U.S. border info desk at the new International Terminal at YYC Calgary International Airport. Image courtesy of Calgary Airport Authority. The past 60 years has seen an explosion of technological developments in every area of business affecting every industry and changing the ways in which we do things. Applied Electronics’ significant role in this explosion was thanks to Michael Stechly’s fascination with technology. “He got his inspiration when he saw his first television set in the barber shop at the end of the street, and he decided right then and there that that was what he was going to do with himself,” says Paul Stechly, Michael’s son and current president of Applied Electronics. Michael studied to become an electronics technologist and after five years working for others he started his own company in 1958, Applied Business Systems (renamed Applied Electronics Limited in 1961), in Toronto, Ontario. He operated this fledgling business with a secretary as the only other employee, but his drive, knowledge and ability to foster incredible relationships soon saw the company flourish. As the Canadian broadcast industry grew, so did Applied Electronics. Michael Stechly built a reputation for quality, service and integrity, making his company a leader in the television-broadcasting industry before successfully expanding into and quickly gaining prominence in the audiovisual industry. By the time of Michael Stechly’s death in 1985, he had diversified and expanded his business into four markets across the country – the head office in Toronto and regional offices in Montreal, Vancouver and Calgary. He had built his dream into one of the leading and largest broadcast and AV companies in Canada. 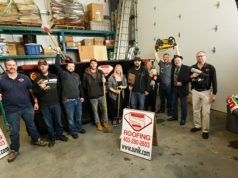 Sons, Paul and John, along with daughter, Susan, picked up their father’s torch and have proudly carried on his legacy, growing the company to 130 employees and expanding operations to Edmonton in 1993 and Ottawa in 2013. Over the past 25 years, Applied Electronics has enjoyed steady growth as it continues to adapt to the pace of change in both technological advancements and the ways in which companies want to do business. Whether it’s governments operating in more meaningful, cost-effective ways, retail outfits grasping attention with dynamic storefront digital displays, or interactive multichannel retailers, educational institutions or houses of worship offering live-streamed content across multimedia platforms, Applied Electronics has been a valued entity in today’s converged media landscape. “Television is migrating to other forms of media distribution and, realizing that most of the media is going to be distributed in other ways and the sophistication and complexity of media growth everywhere, we see the future of the company as that of converged media technologies,” says Paul Stechly. The ways in which people work is changing and the demand for access to information and media is astounding. Companies are tapping into different ways of creating, storing and sharing their content to audiences on various platforms, which has led to Applied Electronics’ exponential growth outside its broadcast beginnings. The company’s diverse portfolio of clients means Applied Electronics’ handiwork can be seen in all corners of the business world. Utilities and energy companies across Canada have turned to Applied Electronics to design and build state-of-the-art control centres. Educational institutions employ Applied Electronics to design and equip lecture halls, build media production studios and simulation labs, and provide mobile production trucks for live-event broadcasts. Corporations and health-care authorities enhance their meetings with videoconferencing, unified collaboration systems, record and live-stream solutions for training purposes. Federal, provincial and municipal governments across Canada have also selected Applied Electronics to design and build complex media systems for various applications and government spaces. With a presence in everything from broadcasting to health care to emergency response, Applied Electronics has evolved along with the times. More accurately, Applied Electronics has stayed ahead of the times. The company’s team of systems designers and solutions architects have been trailblazers in developing innovative systems for unique applications. Backed by a highly-skilled group of in-house technical experts and strong partnerships with industry’s technology giants, Applied Electronics is able to develop systems that push the envelope of innovation to keep their clients on the leading edge. “We’ve been involved in quite a few firsts,” says Paul, with Applied Electronics being credited with selling one of the first data projectors in Canada, some of the first uses of recording in medical operating fields, the first launches of legislative television and automated-voting systems, and the first real-time distance-learning link for teaching hospitals. Since the company became established in Alberta in 1967, the western operation has grown significantly. While not a separate business unit, the area has regional management with a level of autonomy to do business in a way that makes sense for the western provinces. “It’s a sign of our growth to have a specific focus to each of the eastern and western regions,” says Cheryl Bruley, western regional manager for Applied Electronics. And growth has been swift. 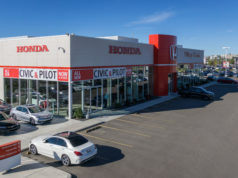 In 2014, the Calgary operation outgrew its 4,500-square-foot office and moved into its current 16,000-square-foot facility on 29 Street NE. This allows ample space for technical system pre-building, the service workshop, and logistics management and warehousing of the significant amount of media equipment needed to serve Applied Electronics’ Alberta customers. Through this office, Applied Electronics has been part of many impressive projects over the years. Applied Electronics has worked extensively with Calgary Sports and Entertainment Corporation, building the initial Flames TV control room in 2004 and, most notably, rebuilding it from the ground up after the 2013 flooding. More recently, Applied Electronics designed and built a fibre-optic-based system to remotely link McMahon Stadium cameras to the control room at the Saddledome during football games. The scoreboard at McMahon Stadium can be controlled by the operators in the Saddledome control room 10 kilometres away. 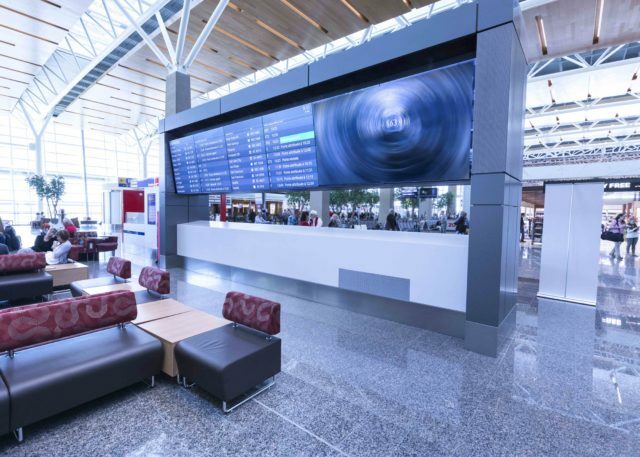 At the new YYC Calgary International Airport, Applied Electronics integrated a number of “big board” displays on both the U.S. and international levels and at check-in desks. These large video walls communicate flight information and arrival/departure schedules, as well as display advertisements for in-terminal retailers. They are part of the Calgary Airport Authority’s complex digital signage and way-finding system that enhances U.S. and international passenger in-terminal travel experiences. Adjacent to the YYC terminal is the Calgary Airport Marriott In-Terminal Hotel, where travellers can host or attend meetings and conferences in any number of the large event and conference spaces available. Applied Electronics designed the state-of-the-art audiovisual systems in these spaces to match the YYC hotel’s sleek, modern decor and liven up the “fly-in, fly-out” meetings and events. A large uniquely curved video wall built by Applied Electronics in 2002 for the City of Calgary’s Transit Operations Control Centre managed communications and the coordination of drivers and routes. In early 2018, renovations of the Calgary Transit facility concluded with Applied Electronics upgrading it with two massive, curved video walls that tie into a complex intelligent transportation system. Transit staff can now monitor and manage live-video feeds from its 10Gb fibre-optic IP-based security camera network, advanced geo-tracking, real-time travel information, and passenger and route analysis data. The company has also recently completed the new Immersion Studio located in the Riddell Library and Learning Centre at Mount Royal University – which will be ready for use by its students and faculty starting in fall 2018. The space features 10 projectors in a 116×8.5 feet (986-square-feet) space, which displays digital media from one or multiple sources up to 360 degrees. It is an experiential and immersive resource for teaching, learning and research. The Immersion Studio can also be used for virtual-reality experiences using the library’s oculus rift equipment. Projects like these have put Applied Electronics on the international radar. The company recently joined the Global Presence Alliance, which is a consortium of audiovisual and collaboration technology integrators aligned through a common methodology, operational infrastructure and bond of trust to deliver and support collaborative workflow solutions as one to global customers. 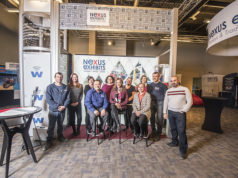 This association of 28 companies selected Applied Electronics as the sole Canadian representative for its reputable quality, technical ability and innovation in the field. Quality and service have been Applied Electronics’ mantra for 60 years. Through all the changes, Applied Electronics has remained true to Michael Stechly’s philosophy of steady growth, commitment to the communities in which they do business and treating staff like family. Now, as the third generation enters the company to learn the ropes, it will continue to honour the founder’s vision. “We’ve been one of the few companies that has been able to prosper and grow in a rapidly-changing business where the speed of that change has become faster and faster,” says Paul Stechly. The Stechlys have come a long way since that barber-shop television set sparked a passion in Michael. The generations that have come after him are ready to meet these rapid changes, forge change of their own, and continue to make Applied Electronics the largest media-solutions specialist in the country for years to come.